Capture your student’s attention with the power of Puppetry. These creative and instructional hands on sessions explore how you can easily add the excitement of puppetry into any lesson plan. Sessions will be created to fit your special interest or the curriculum you intend to teach. Perfect for all ages. Explore the ancient world of shadow puppetry. Make a stage from a cardboard box, or sheet and pull the old overhead projector out of the school storage closet. Consider this fast, easy, fun and affordable way to create endless puppetry possibilities. Turn trash into treasure and help save the Planet Earth while making puppets. Learn to create an array of fascinating characters without spending a lot of money on supplies. These workshops for young or old are designed to match your interests and availability of items needing recycling. Geared for early child hood education. 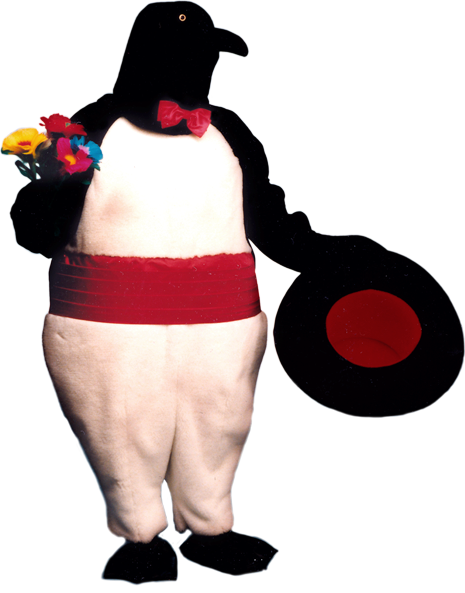 Imagine giant loveable huggable and friendly Professor Penguin entering the classroom and sharing knowledge about the life and habitat of real penguins. Plenty of fun and excitement will abound from this memorable interactive creative dramatic experience. Learn to make and perform with simple rod puppets, using puppets from the Puppet Pizzazz collection. Or we can teach you how to create your own puppets and plays. Create your own unique masks and learn how to use them in your own dramatic production. Great for older students and the artistically inclined. Workshop fees are determined by session time, enrollment, design and preparation. Please contact Puppet Pizzazz to determine what would work best for you.